There’s so much to like about this display card. First, that it is a display card — in other words, that pencil leads were deemed important enough to be given this treatment. (My guess is that the cards stood upright in a holder on a store shelf.) I like the contrast between the sharp serifs and the italic script. I like the repetition: 5H, 5H, and the five appearances of leads. (The fifth leads, hidden from view, is on the cardboard tube.) I like 5H, which suggests that any store that sold these leads sold a great range of replacement leads. (“I’m sorry, sir, but we’re all out of 6H right now. I can offer you something in a 5H, if that would be satisfactory.”) And I like the lines above and below Harvest, four above, four below. 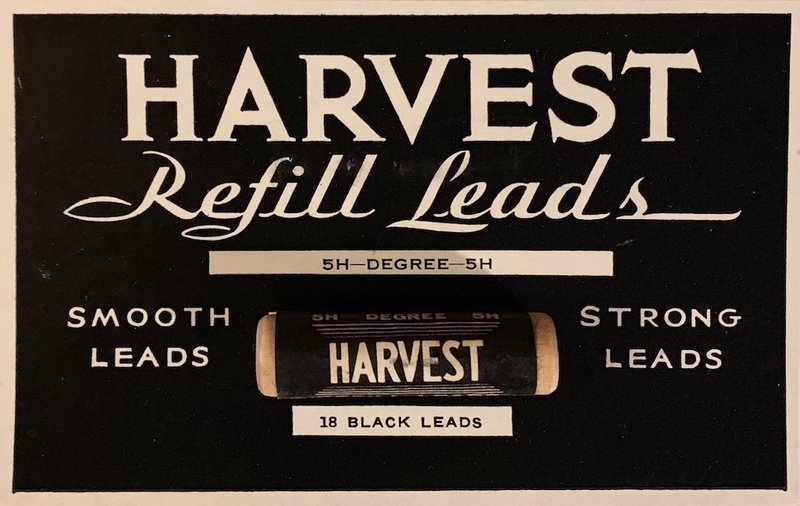 I’d never heard of Harvest Refill Leads, a product of the venerable Musgrave Pencil Company. (The manufacturer’s name appears on the tube.) The Internets return nothing for harvest leads, with or without the word refill. But Musgrave still manufactures a Harvest pencil (wood-cased, not mechanical). From the company’s website: “It’s rumored that our great-grandmother named this premium line ‘Harvest’ after the yellow harvest moon.” Shine on, Harvest pencil! January 29: Henry Hulan, whose grandfather started the Musgrave Pencil Company in 1916, tells me that the Musgrave sold refill leads in the 1930s and ’40s. But the company has never made mechanical pencils, only wood-cased ones. I am following Henry’s lead (no pun intended) in using the word wood-cased instead of wood. This post is the twentieth in a very occasional series, “From the Museum of Supplies.” Supplies is my word, and has become my family’s word, for all manner of stationery items. The museum is imaginary. The supplies are real. Well, I just spent a good ten minutes getting lost in the glories of Musgrave Pencil Company! Time very well spent. Special order, or standard stock? Round, hex or carpenter? I like carpenter pencils. Used to watch my father sharpen his with his pen knife when I was a kid. I liked drawing with one; nice wide line of graphite. The company is so accommodating to its customers, offering Pantone colors for the shaft, lettering and ferrule choices. You could even design your own pencil box! I vote for a silvery sardine as your logo. @The Crow: I think the Harvest is beautiful just as is. But if it’s sardine-themed, it has to be skinless and boneless. @Sean: I hope to hear back from Musgrave with some idea of the date. My guess is no later than the 1940s. I have some Musgrave naturals, but don't see them on their site. No, the standard branded pencils are limited. I have a natural, a yellow pencil (just says Musgrave), a scoring pencil, and a Unigraph. But...but I thought it was only sardine if it had skin and bones. Otherwise, it is just fish product, along the lines of Cheez-Whiz, isn't it? Well, not exactly Cheez-Whiz, but it is reprocessed. Maybe more like smooth and chunky peanut butters? I don’t know exactly how they get the bones out, but I think they’re still legit fish. The King Oscar site says “The fish are skinned and boned, then hand-packed,” and so on. They sure look like real fish — I hope they are!